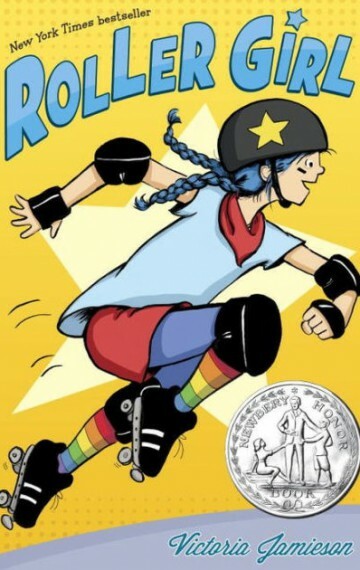 This is a cute, fun story of a girl who starts junior roller derby the summer before seventh grade (which is the start of junior high). Astrid’s voice is very strong throughout the book, as the graphic novel format provides space for some clever asides from her in a 4th wall-breaking way that totally works in the story. 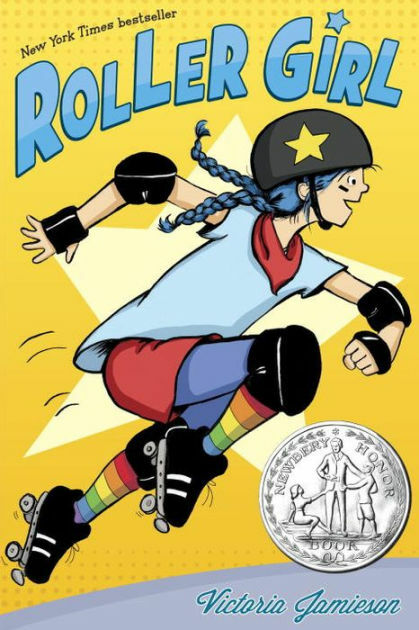 A graphic novel is the perfect way to depict learning how to play roller derby–there are some great sequences where Astrid falls down over and over again, and the way comic books portray action (especially punches) is a great fit for visualizing the hip-checks of the sport. I actually am familiar with derby, having seen a few bouts and been to a beginner camp myself, and the book does a fantastic job of conveying the excitement, devotion, and acceptance of roller derby and its community. The book reminds me a lot of Sunny Side Up in how they both deal with issues that many 10-12 year olds struggle with in a very positive way. 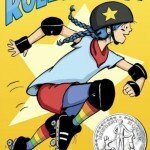 In Roller Girl, Astrid tries to handle growing apart from her best friend of many years. When Nicole goes to dance camp instead of derby camp, Astrid takes it as a betrayal: best friends are supposed to do everything together, so Nicole’s admittance that she has different interests creates a rift in their friendship. I really like how Astrid does not handle this revelation well at all, and eventually realizes that she’s being immature and selfish about it. I also like how the dynamics of their friendship subverted my expectations. Nicole is actually the braver, more daring one in their relationship: they actually become friends when Nicole comforts a sobbing Astrid. More than once, Astrid thinks about how much braver Nicole is, and how she would have an easier time trying something new with Nicole there with her. Given their interests and personalities–Astrid’s hatred of pink, Nicole’s exploration of fashion and dating–I would have expected the reverse in this type of story. Because Astrid sees Nicole as the braver one, their relationship is much more nuanced, and it means Astrid sees her potential loss of Nicole as much more than losing a friend; she’s losing the person who helped her be brave. It also makes their characters more complicated than they would be otherwise. This is a great book to have in 4th-6th grade classrooms, right when many students have the kind of experiences Astrid and Nicole have. This could also be a really fun read aloud at the beginning of the school year, especially in 6th grade. Students could also use the friendships to explore the nature of friendships, and what their own friendships are like–how Astrid and Nicole’s friendship is different from Astrid and Zoey’s and Rachel and Nicole’s. The low reading level is partly because it’s a graphic novel, I think–graphic novels tend to have lower levels. I’m not sure how much a third grader would relate to it, but I think it’d be perfect for 4th-6th.